Thanks to numerous punts and less-than-inspiring play, Super Bowl LIII turned into a Super Dud. 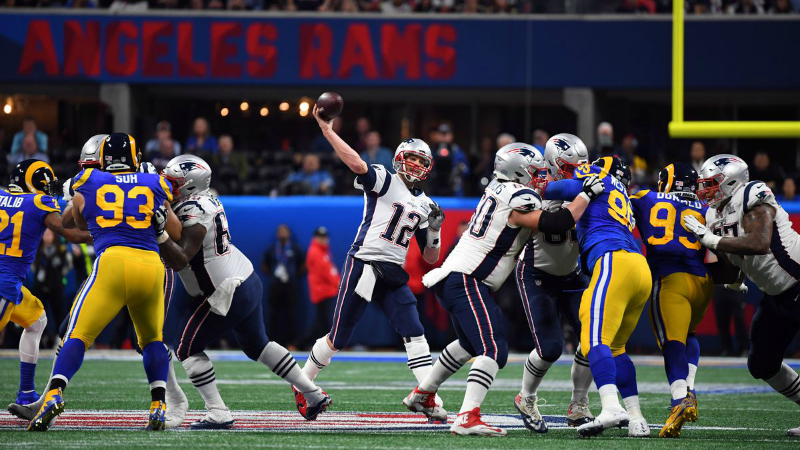 In the lowest-scoring game in Super Bowl history – sixteen points in total, the New England Patriots and Los Angeles Rams settled for a 3-3 tie at halftime in a game featuring numerous punts and incomplete passes. In the second half, the Patriots scored the lone touchdown of the game en route to a 13-3 victory over the Los Angeles Rams. The Rams’ three points is the lowest scoring output on record in a Super Bowl. To put everything in perspective, the Vancouver Canucks scored five goals in a victory the previous evening in a game against the Colorado Avalanche. The game perhaps reminded many of Super Bowl V, which was referred to as the “Blunder Bowl” or the “Stupor Bowl” as the matchup between the then-Baltimore Colts and Dallas Cowboys was also filled with poor play, numerous penalties, and other miscues. But the game did have a higher score total, as the Colts beat the Cowboys 16-13. Not surprisingly, the ratings reflected the poor play as the big game drew the fewest viewers in over a decade. According to Nielsen, Super Bowl LIII airing on CBS fell below the 100 million mark, drawing 98.2 million viewers on the network with an additional 2.5 million coming from streaming services and ESPN Deportes, bringing the total to 100.7 million, down from the 104.3 million from Super Bowl LII (Patriots-Eagles) last year. On the Programming Insider website, I predicted the game would draw 107 million viewers – off (way off) by about seven million viewers. Ratingswise, Super Bowl LIII drew a 44.9 household overnight rating, the lowest for a Super Bowl since Super Bowl XLIII in 2009 (Steelers-Cardinals) and was down 5.3 percent from the 47.4 rating Super Bowl LII earned and down 8 percent from what Super Bowl LI earned (Patriots-Falcons.) The final rating was 41.1, down 5 percent from last year. Worse, the game scored a 31.0 rating and 40 million viewers in the adults 18-49 demo – the lowest since 1992, down 7 percent in rating from last year’s Super Bowl. The game scored a 34.6 rating in another important demo, adults 25-54. The Patriots’ home market of Boston (WBZ) led all 56 metered markets with a 57.1 household rating, followed by Richmond, Va. (WTVR, 52.6) and Buffalo (WIVB, 52.4). The Rams’ home market of Los Angeles (KCBS) earned a 44.6 rating, considered to be the lowest rating for any city participating in the big game. Both WBZ and KCBS are owned by CBS. Los Angeles historically has had trouble drawing big audiences for their hometown teams not named the Lakers or Dodgers – the same was true for the Los Angeles Kings’ two Stanley Cup Final appearances in 2012 and 2014, dragging down the national national rating. Nearby Anaheim’s teams (Angels in 2002 and Ducks in 2007) also had the same problem. In the Rams’ former home of St. Louis, the game earned a 38.9 rating on KMOV – ranking 53rd. But the least-watched market came from the home of the Saints- New Orleans, drawing a 26.1, the lowest number ever on record for a Super Bowl in that market. Chicago numbers were not available; they’ll be posted in this space once they are released. There are several reasons why the numbers for the Super Bowl were down significantly from previous years. For one, New Orleans viewers tuned out en masse – thanks to a non-called pass interference penalty play late in the fourth quarter during the NFC Championship Game between the Rams and Saints. Many Saints fans felt they were robbed of their chance to return to the Super Bowl, generating significant outrage throughout the entire state of Louisiana. Thus, viewers refused to watch the game. Saints fans weren’t the only ones sitting out the game. Many African-American viewers across the country decided to boycott the Super Bowl due to the league allegedly blackballing Colin Kapernick for kneeling during the National Anthem in 2016, as he hasn’t played in the league since then. Though it wasn’t notable the last two Super Bowls, the #BoycottNFL hashtag picked up steam in recent weeks after numerous African-American performers turned down an opportunity to perform during the Halftime Show, or be associated with the game altogether. There’s no doubt Super Bowl viewership among African-Americans is likely to be the lowest in recent memory. Another reason why the numbers were down was due to “Patriots fatigue”. Non-fans certainly had enough of watching Tom Brady and Co. play in the big game as they have represented the AFC four out of the last five years and won three out of the last five Super Bowls. The same can be said for the dynasties of the Boston Red Sox and Golden State Warriors, whose championships last year didn’t exactly break ratings records. 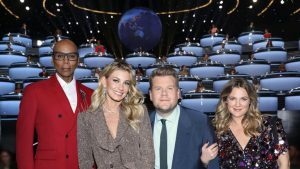 As for the post-Super Bowl entertainment, CBS launched a new reality competition show World’s Best, hosted by James Corden. It’s a talent competition – a cross between 1 vs. 100 and America’s Got Talent – if not a direct ripoff of the latter program. The debut drew 22.2 million viewers, but down from the 38.7 million viewers for the premiere of Undercover Boss after the Super Bowl in 2010.